Clare will be working in Archway between the 21st February and the 10th March. 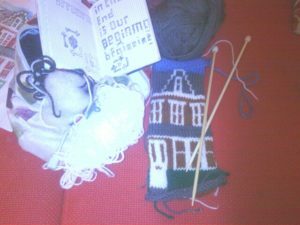 During this time she will work with local knitters to produce a collection of panels depicting stories that have been shared with her by the participants and others. The knitters don’t have to be very highly proficient as Clare can give advice and techniques can be adapted to suit ability. She’s likely to only need committment to a single session, with the option to return on future days if desired. The knitters would knit onsite on Junction Road where they’d be visible as they worked, with the resulting works exhibited simultaneously in the shop. Clare’s project is part of a larger series of commissions called A Million Minutes (http://www.amillionminutes.org/about) a two-year programme of arts commissions in Archway and Finsbury Park Ward. Clare’s project will happen at 36 Junction Road in Archway; a spruced up disused shop that is being used for a series of arts activities that are visible from the street and often participatory.